When it comes to trucks Ford has always been one step ahead of all other American manufacturers. Its F Series is the best selling truck series for over 40 years and is also the best selling vehicle in whole United States for the last 20-something years. Star of Ford’s F Series is the F150, only non-heavy duty vehicle in this series and all the above best selling figures are mostly achieved by this highly popular pickup truck. Ram trucks are Chrysler’s answer to the Ford’s F Series and GM’s Chevy Silverado and GMC Canyon. This truck was launched in 1981, and labeled as Dodge Ram. Name came from the Ram ornament seen on Dodge vehicles in the thirties. Ram Series came as a replacement for the older Dodge D Series of trucks that’s been around since 1961. Important year for these trucks was 2011, when RAM brand was made into separate division of Chrysler. That’s the year when Fourth generation Dodge Ram 1500 changed its name to RAM 1500. 2015 was an important year for Ford F150, since it successfully went through a complicated change from regular to aluminum hood, and now it became one of the first light weight trucks on the market. Unfortunately this wasn’t followed with some big exterior updates, so the new model basically looks the same as the models that came before this truck received light weight chassis. RAM on the other hand, that is still regular weight pickup, gives a lot of attention to the exterior styling since its 1994 model. 2015 RAM 1500 comes with different grille for each trim level. These grilles all come with different textures and schemes, even each one has a different name. All trim levels come with LED lightning in the back, while only higher trim come with dual exhaust fared into the rear bumper. Some people think that Ford F150 is missing a more masculine stance, which is a must for an American truck. It comes with a big and powerful looking grille and headlamps that are fared in the back, which makes the front more friendly and soft, that’s maybe not the smartest thing to do when it comes to truck design. On front fascia it is also easy to notice rectangular inserts. that are placed to evoke the look of some early trucks from the F Series. When it comes to interior styling of the 2015 Ford F150, the most notable change is the one concerning the air vents, with the old ones missing and the new ones placed on the central console. Higher trim levels come with the nice leather upholstery and wood trim, but overall luxury features provided for the higher trim levels like: King Ranch and Platinum are much less luxurious than RAM’s Laramie Longhorn trim. 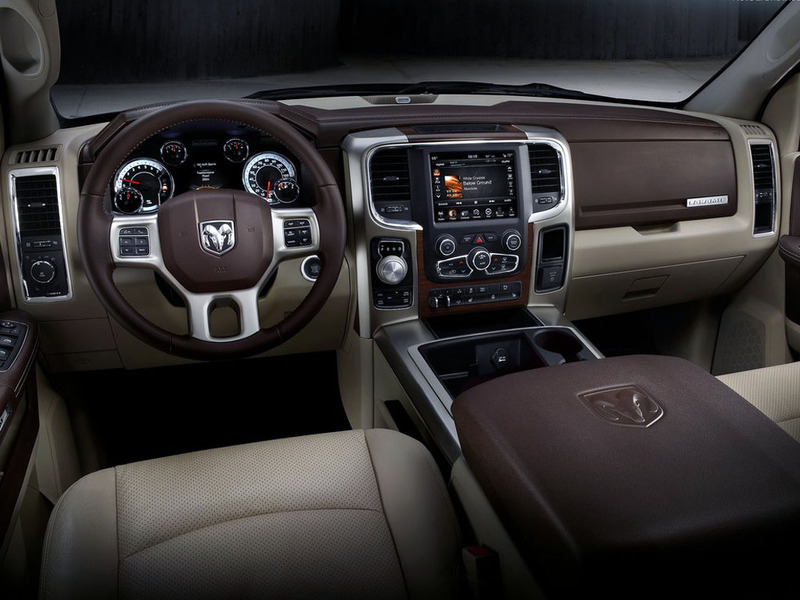 2015 RAM 1500 comes with a revoked interior styling. One of the biggest changes hit the central stack that’s now received rotary controls and comes with much more free space. This truck’s trims offer different levels of luxury. Super-luxurious Laramie Longhorn comes with some of the finest wood trim on the market, while lowest Tradesman trim is meant for the buyers with simpler tastes and less money to spend. Ford F Series comes in three different styles, Regular, Extended Super Cab and Super Crew. First two styles come with two, while the Super Crew comes with four door configuration. All body style versions come with roomy front seats and same central console and door arm rest made at the same height which is good for your back on the long run. Central console is spacious with enough space to put a lap top, drinks, cell and few more things. Back seats are very small in Regular and Super Cab styles and bigger in SuperCrew, but even in the first two styles they come with an increased leg room, which can also be used for storage. RAM 1500’s cabin is not much bigger than the one in Ford F150, but it definitely comes with better layout, storing options and interior comfort. This truck comes in Regular, Quad and Super Cab body styles, and same as with Ford first two come with two doors, while the Super Cab comes with four doors. Due to its wide stance this truck comes with a lot of space in both front and back seat row. There is also a bucket seat to choose, which comes with central console separating the passengers. All Ram styles and versions come with fantastic door trims, that can be seen in some much more expensive sedans. When it comes to storage this vehicle is more than well equipped. It comes with storage bin in the front, deep door pockets and central console cup holders, space under the sets and the central bucket seat that can be folded and used as a storage space or the arm rest. New model also gives us more soundproof and less turbulence in the cabin due to improved suspension. Ford F150 comes with a five trim levels in three versions that go from packages made for working people to the ones made for full pleasure. Base version comes with manual windows, FM/AM/CD audio, air conditioning and flipping seats. Nothing too fancy, but the luxury comes with the higher priced packages. Some of the features that you get with an XL trim are: BoxLink, SYNC and cruise control. XLT trim adds power locks and power windows. Next trim is the Lariat that comes with: rearview camera, ambient lightning, power-adjustable pedals, leather upholstery, heated seats and a satellite radio. Kings Ranch trim level offers: inflatable seat-belts, heated and ventilated seats and leather upholstery and door trim. On the top of Ford F150’s trim level offer is the one and only Platinum trim, that comes with: blind-spot monitors, power running boards, remote power start button and tailgate remote control, rear parking sensors; , ambient lighting, navigation system that can store five years of data and all the other features that come with all the lower trim levels. RAM 1500 comes with 10 different trim levels for the 2015 model year. These can be paired with all three body-style versions, accept fuel economy models that only come with two door versions and Laramie Longhorn trim level that can be combined only with four door version.Base version doesn’t bring a lot when it comes to interior features, since this truck is often bought for the industry. In higher trim levels you can expect to find Bluetooth, UConnect infotainment system, remote start, rear-view camera, heated and ventilated leather seats etc. Laramie Longhorn is the star of RAM’s line up. This trim comes with a real wood trim, made from the fallen fencepost, satellite radio, navigation system with 3D graphic, DVD players for the front and back seats and 8,4 inches display for the UConnect infotainment which is considered to be one of the best infotainment system in the class. Ford’s model come with beds of different sizes from 67,1 to 97,6 inches. Depending on the version and the trim bad layouts are different, same goes for the towing capability and payload capacity. These figures go from 1,600 pounds of payload and 5,000 pounds of towing capability to 3,300 pounds of payload capacity and 12,200 pounds of tow. Beds can be customized with loading ramps, LED lightning, slide-out tailgate step etc. RAM 1500 beds go from 64 to 80 inches capacity, so they are little bit smaller than the ones seen on Ford F150. They can also be customized with various useful features, but seems to us that Ford give much more in the bed section. There is a lot of engine options to choose from in the RAM 1500 line up. Before we jump to these engines it is important to point out that this truck is the only one that offers diesel engine in its line up, and this makes him stand out when it comes to performance comparing to other trucks and Ford F150 of course. 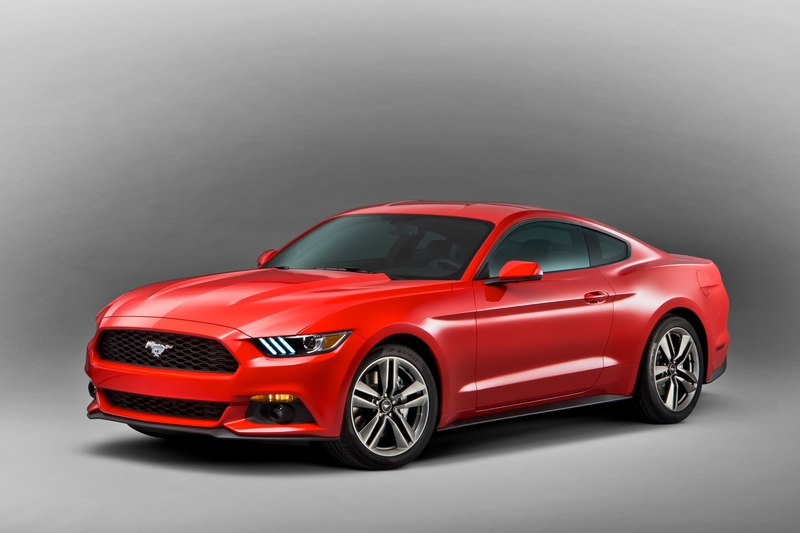 Base version comes with the 3,6 liter V6 which bring an output of 305 horsepower and 269 pound feet of torque. This is ideal for buyers who need more bed space, than towing capacity. There is also a HEMI option, that provides 395 horsepower and 407 pound feet of torque, with acceleration little bit over than 6,7 seconds from 0-60 mph. Most fuel efficient out of all engines is the 3,0 liter turbodiesel V6 engine that produces 240 horsepower and 420 pound feet of torque. It comes with 28 mpg of highway fuel economy, it needs 8 seconds to reach 60 mph and it has respectful towing capability of 9,200 pounds. All these engines are paired with eight speed automatic transmission and come with the four wheel drive options. Shift towards aluminum and light weight truck construction made F150 one of the most fuel efficient and easiest trucks to handle. With all the changes that this truck went through it lost more than 500 pounds of its weight. Base version comes with the 3,6 liter V6, which is here to replace the old 2,7 liter. This engine comes with 283 horsepower and 255 pound feet of torque, payload capacity of 1,910 pounds and towing capacity of 7,610 pounds. Next in line are the two turbocharged V6 engines that are really agile for their size. 3,7 liter one is capable to produce 325 horsepower and 275 pound feet of torque, coming with tow capacity of 8,500 pounds which is close to smaller V8 engines. While the 3,6 liter turbo comes with 364 horsepower and 420 pound feet of torque. Top of the line engine is the 5,0 liter V8. This beast is able to produce 385 horsepower and 387 pound feet of torque, with maximum towing capacity of 12,200 pounds. These engines are paired with six speed automatic transmission with four wheel drive option being available in all trim levels. 2015 RAM 1500 base version could be bought for $25,040. There are 10 more trim levels available in three versions, so we’d want to list all the prices we’d double the size of this post. Laramie Longhorn is the highest trim level and it can be bought for $46,935. Base version of 2015 Ford F150 can be bought for $25,420. This truck also comes with numerous packages that combine its three body style versions with available trim levels. 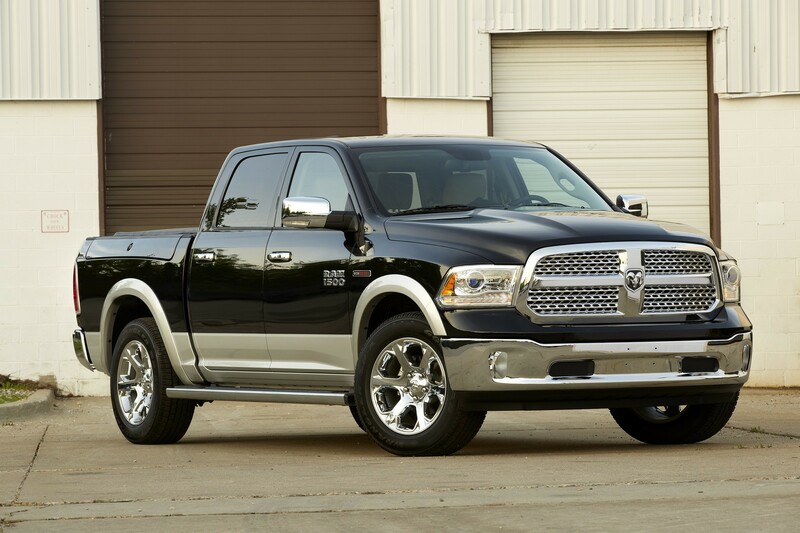 Two highest trim levels are Platinum and Kings Ranch, and they are both more expensive than the RAM’s Longhorn. Platinum can be bought for $52,155, while the Kings Ranch costs $49,690. Insurance rates for the RAM 1500 Tradesman trim level go from $1,296, up to $1,390, depending on the body style version. Laramie Longhorn trim which is the highest in this vehicle’s line up can be insured for $1,560. These figures are national average, depending on the state this figures can go up and down for more than 200%. For example in Michigan, state with most expensive car insurance, or Texas and California that both have rates bigger than the national average. Ford F150 insurance rates are almost the same as the RAM ones. You will need more money to insure Kings Ranch or Platinum trim, while base versions come with basically equal rates. What Do Girls Think, Which One Is Better?